Written by my teacher and mentor, Rich Holly has decades of experience as a percussion professor, Department Chair, and Dean in higher education. 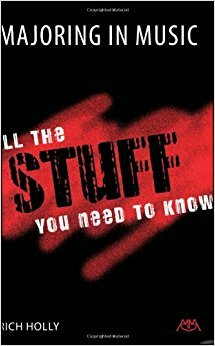 The book is in bite-size segments for quick reads and is divided into the "Academic Stuff," the "Musical Stuff," and the "Life Stuff." Highly recommended for any high school students considering music school at the collegiate level. Required reading for my first-semester freshmen. A classic for students working on addressing performance anxiety. Also worth considering The Inner Game of Music. An oldie but a goodie. I first read this in college and the ideas surrounding pro-activity and habits have stuck with me ever since. A big thanks to my friend Ben Wahlund for gifting me this book. It inspired me to do the same for my friends ever since. So if you're paralyzed with fear, it's a good sign. It shows you what you have to do. This book really helped me have a fluid scheduling vantage point, thinking in weeks instead of days. Some days things just aren't possible, but within a week almost anything can be done. Great read. One of my favorite books for discussion in my percussion pedagogy seminars, Peak discusses how to master any skill through the lens of "chess champions, star athletes, and memory mavens." Perhaps my favorite case study is the discussion of London cab drivers who must master a list of 320 runs as a starting point for taxi-driver candidacy. The memory of these 25,000+ streets is cross-referenced with the other areas mentioned above to find trends that lead to the discussion of purposeful, and later, deliberate practice. Reflect - I prefer the word review which is commonly used. Reviewing my list daily and weekly helps me keep priorities in order. Engage - do the items that have risen to the top of the priority. Allen speaks about the mind being a place for having ideas, not storing them, and that system works very well for me. Similar to Peak mentioned above, Ferriss has made a habit of studying the "tactics, routines, and habits of billionaires, icons, and world-class performers." I really enjoyed The 4-Hour Workweek also by him, but what is interesting about this book is it is compiled as a collection of dozens and dozens of short articles featuring individuals. It is easy to dive in and out of and is organized into the categories Healthy, Wealthy, and Wise. It is a great candidate for a short read as part of a morning routine or for a shot of afternoon inspiration after lunch. More information in this text than one could possibly consume in a lifetime. Connect with at least one person each day who has nothing to do with your work life. Consider it like a fifteen-minute vacation. It might be a good friend, a mentor, or perhaps one of your kids who is away at college. Keeping it real doesn't mean keeping it negative. It is equally important to catch your people doing good things and hold them – and their actions – up as a model. Understand that in some cases, your best people are not always your most assertive people. Sometimes you have to coach aggressiveness, just like you would any other skill. If something matters, track it and post the results. This helps make your priorities clear. Growing up in Illinois in the 1990s, Phil Jackson was a big part of my childhood. I was always fascinated by how he then went to the Lakers and won an additional five championships on top of the six with the Chicago Bulls. He has been labeled as the "Zen master" and his thoughts on leadership are inspiring. There is even a great section where Jackson parallels basketball and music / jazz, expressing the importance of awareness, collaboration, and having clearly defined roles.